Antigen: The target protein is fused with N-terminal His-Tag and its sequence is listed below. 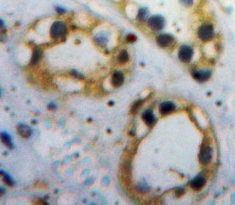 The antibody is a rabbit polyclonal antibody raised against ACVR1. It has been selected for its ability to recognize ACVR1 in immunohistochemical staining andwestern blotting. Supplied as solution form in PBS, pH7.4, containing 0.02% NaN3,50% glycerol. Recombinant ACVR1 (Ile208~Lys340) expressed in E.coli. Store at 4 degree C for frequent use. Stored at -20 degree C to -80 degree C in a manual defrost freezer for one year without detectable loss of activity. Avoid repeated freeze-thaw cycles. Small volumes of anti-ACVR1 antibody vial(s) may occasionally become entrapped in the seal of the product vial during shipment and storage. If necessary, briefly centrifuge the vial on a tabletop centrifuge to dislodge any liquid in the container`s cap. Certain products may require to ship with dry ice and additional dry ice fee may apply. Western Blot: Sample: Recombinant ACVR1, Human. NCBI/Uniprot data below describe general gene information for ACVR1. It may not necessarily be applicable to this product. ALK2: On ligand binding, forms a receptor complex consisting of two type II and two type I transmembrane serine/threonine kinases. Type II receptors phosphorylate and activate type I receptors which autophosphorylate, then bind and activate SMAD transcriptional regulators. Receptor for activin. May be involved for left-right pattern formation during embryogenesis. Interacts with FKBP1A. Interacts with FCHO1. Expressed in normal parenchymal cells, endothelial cells, fibroblasts and tumor-derived epithelial cells. Belongs to the protein kinase superfamily. TKL Ser/Thr protein kinase family. TGFB receptor subfamily. 1. the Fibrodysplasia Ossificans Progressiva mutation ACVR1(R206H) is more sensitive to a number of natural ligands.